In his mind on that special occasion, his request was simple: “you could do it any day, except on the Fourth of July.” Yet he may have been a bit too forceful in expressing his thoughts, his actions and intentions interpreted in the worst possible light, and things quickly got out of control. 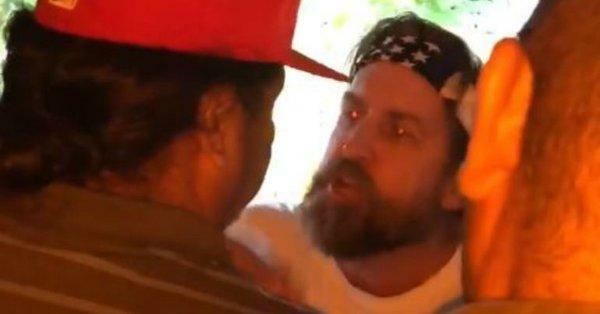 The California man in the now viral-video where he is captured cursing his neighbors for playing Spanish music on the Fourth of July has come forward to issue an apology. His neighbor opted to bring their little altercation to the volatile world of social media, and in the process succeeded in “humiliating”’ Lappin. He was slammed for being “racist” and others even wished he’d lose his job. Ivette Celedon shared a video of Lappin confronting her family at the front porch of their house. Lappin has received quite his share of bullying reaction messages about the video online. Aside from his public apology, though, he also said he intends to personally apologize to the family he confronted on the Fourth of July. Even after the apology, some liberal social media users remain unforgiving, and continue to wish ill of Lappin. Why even apologise? It won't help at all. If you ignore it then at least it doesn't add fuel to the fire. The guy finally snapped after 24/7 365 la cucarocha blasting throughout the barrio.